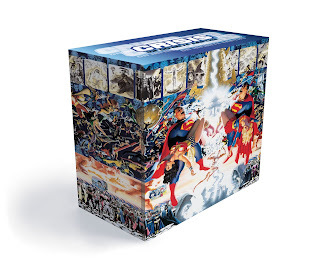 DC Comics' June 2019 trade paperback and hardcover solicitations kick off with a bang with the Crisis on Infinite Earths Box Set. Would it collect all of DC's "Crisis" events? Would it be the original series plus the recent deluxe companion books? No and no -- it's all the old Crisis on Multiple Earths paperbacks, now in hardcover, plus Crisis itself and then the deluxe books re-cut into character-specific hardcovers, plus History of the DC Universe(!). Fourteen hardcovers in all -- that is one heck of a box set! To think, if not for that, the big headline might be stories from the Walmart "Giant" collections appearing this month in Swamp Thing: Roots of Terror and Wonder Woman Vol. 9. Good news for fans of the "Rebirth Deluxe" hardcovers, as the Batman Deluxe Edition Book Four (the wedding volume) solicited here sans "Rebirth" suggests those are still happening in the "New Justice" era. I also wonder if something's up with the Essential Editions line, as the New 52 Wonder Woman: Blood and Guts solicited here is a formerly listed Essential Edition now without that moniker. Issues #25-30 (formerly through issue #29) by Dan Jurgens, with Brett Booth, Cully Hamner, and Doc Shaner, among others. With "behind-the-scenes content." Also well deserving of omnibus, this is "the first 33 issues" of Scott Snyder and Greg Capullo's Batman run, so the paperback volumes 1 through 5, to the end of "Zero Year." This run went through issue #52, so the second omnibus would be shorter than the first (though I agree with how they split it), though annuals and etc. have to be in there, too. Issues #45-57 and the DC Nation #0 story, being the Wedding and Cold Days collections. An indication that these "Rebirth Deluxe" hardcover editions are continuing, that this is just called "Batman Deluxe" without the "Rebirth" moniker. First collection of the new Kat Howard Vertigo series, with issues #1-6 and the Sandman Universe Special #1 (apparently collected in all the first volume Sandman Universe trades). I'm going to list the contents in full below because I think they're worth mentioning. Something that strikes me in particular is the inclusion of History of the DC Universe, which was really well-done and set the foundation for the post-Crisis DC Universe, and also served as something of an epilogue to Crisis. It seems long overdue that History should be reprinted alongside Crisis. Another box set, leading me to wonder if this is going to be a thing now, though this one's a whole lot more manageable -- just Flashpoint and the Batman, Green Lantern, Flash, Superman, and Wonder Woman tie-in books, all in paperback. Basically what was already released, with a box. Said to collect issues #43-47 and the Annual #2 by Julie and Shawna Benson, but it's hard to believe seeing as how the Rebirth Green Arrow series is ending that this won't also have issues #48-50 by Collin Kelly and Jackson Lanzing. Issues #1-6 and the Sandman Universe Special #1. Issues #25-30 by Tom Taylor. Issues #31-36 and the Annual #2. Again, this is Starro and the Red Lanterns vs. the Titans, Blue Beetle, Booster Gold, and Lobo. Hope Tom Taylor does this sort of thing in DCeased. Previously listed as the Black Label edition by Brian Azzarello and Lee Bermejo, though "Black Label" is now gone from the solicitation. JSA: All Stars #1-8, JSA Annual #1, JSA Secret Files and Origins #2, and JSA #26-31, the latter being a series of one shots in the wake of the return of Hawkman (previously collected in the JSA: Fair Play trade). Resolicited, the new fourth New Teen Titans Omnibus, collecting through and then after the recent New Teen Titans Vol. 10 paperback (issues #10-31 of the second series, Annuals #1-2, and Omega Men #34). The Katana half of the recent Suicide Squad: Black Files miniseries, by Mike W. Barr. Collects stories from Swamp Thing Winter Special 2018 and Swamp Thing Halloween Horror Giant. Tom King and Brian Azzarello are here, plus Len Wein's final Swamp Thing story with art by Kelley Jones. This'll mark the first collection of a story from the Walmart-exclusive books, though more collections are confirmed as coming. Judd Winick's twelve-issue miniseries, following in some respects his Superman/Shazam: First Thunder mini, plus the Brave New World story in the wake of Infinite Crisis. This is when Freddy Freeman was "Shazam" and Billy Batson took on the Wizard's role, with a painterly style by Howard Porter. This was collected in two six-issue bursts before, now all together for the first time. This does not, as I'd hoped, include John Byrne's Wonder Woman-connected Genesis event miniseries, though it does include the Wonder Woman tie-in issue, plus significant JSA and Donna Troy material. Issues #125-136, finishing this collection set. Collects issues #51-55, and now newly solicited, also stories from Justice League Giant #1-2 and the Wonder Woman 75th Anniversary Special. That's Steve Orlando's mini-run ahead of G. Willow Wilson, plus Tim Seeley's two stories from the Walmart-exclusive Justice League Giant. Not sure what's coming out of the anniversary book. Just the first 12 issues of the Brian Azzarello/Cliff Chiang run, the Blood and Guts trades. It is a good introduction to the Azzrello run, though far from complete and it ends on a cliffhanger. I believe this was previously listed as an Essential Editions; interesting to see it simply "un-branded" now. A heavy one that surely should be on the shelves with a TV-show in the offing. One day I'll finish reading this series. So how about that Crisis box set, huh? Do you think DC will release the character-specific "companion" volumes individually? Would you prefer the already-solicited slate of Companion books or these character-specific ones? Sound off in the comments! I'm kind of surprised that DC don't finish up the JLA - JSA team ups with Crisis on Multiple Earths volume 7 and include Justice League of America #219-220, 231-232, 244 and Infinity Inc. #19. That book was never published as a TPB except in Germany. 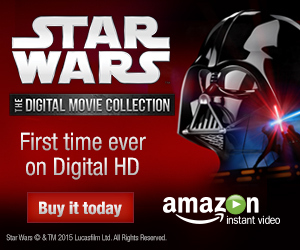 Of course, putting it in the box set without making it available separately would piss off a lot of people. They should include it in the box set and release it later as a separate tpb. I hope, since the solicit states that EVERY Crisis leading up to 1985's COIE will be collected, that JLA 219-220 and 231-232 will be included somewhere. I also think that FLASH 123 (the first Earth-1/Earth-2 crossover) and 137 (reintroduction of the JSA) need to be included in this box set. Those were actually in 2 boom companion series "Crisis on Multiple Earths: The Team-Ups" that for whatever reason aren't in this mega-box. Excited for the Doom Patrol omni. I really loved the Bronze Age iteration a lot. That Crisis set sounds awesome. It is super pricey though. BTW-History of the DC Universe was reprinted along side Crisis in the Crisis of Infinite Earths Deluxe Editions. It was a pleasant surprised when I picked it up. They reprinted it beautifully. Agreed. I wasn't expecting that, when I picked up the Deluxe Edition. Very pleasant addition, in that format. Probably one of the best CoIE collections until this huge box-set. What is Crisis on Multiple Earths? It must be very related to COIE if it is now collected together? Oh and I think I read elsewhere that the Doom Patrol Omni not only includes comics that have never been collected before, but also material that has never even been *published* before. It's all the JLA/JSA crossovers collected from the original JLoA series. However, we're still waiting for Vol. 7 which contains the last three crossovers. Green Arrow Vol. 7 is skipping issues #39-42 by Colin Kelly, Jackson Lanzing and Mairghread Scott, which leads me to believe there will be a Vol. 8 collecting these issues along with #48-50. I guess they just wanted Vol. 7 to collect the entire run by the Benson sisters and nothing else. About Batman by Scott Snyder and Greg Capullo vol. 1, I think they'll eventually amend the content listing so that it includes Batman #0 and Annuals #1-2, which were published in the period covered by #1-33. As for Vol. 2, they could make it almost as thick as the first one by collecting Batman #34-51, Dark Knights: Metal #1-6, the upcoming Batman: Last Knight on Earth #1-3, the sneak peek from the FCBD Divergence one-shot and the stories Snyder wrote for Detective Comics #27 and #1,000, the last of which is pencilled by Capullo. Snyder also wrote #23.something (was it .2? ), a Riddler one-shot, a Future's End tie-in and co-wrote the Batman: Rebirth one-shot. I think those should be included, too. Both Batman #23.2: The Riddler and Batman: Futures End were written by Ray Fawkes, but co-plotted by Snyder and tied to his run with Capullo, so I guess they should be included for completionism's sake. Batman: Rebirth I'm a bit more iffy on because it's really the beginning of King's run, but I think it would be a good fit for a Batman by Scott Snyder Companion Omnibus collecting his Detective Comics run, All-Star Batman, the current Batman Who Laughs mini and the Grim Knight one-shot. Why isnt Snyders pre new 52 run collected in that omnibus? Seems they might just want to stick with his work with Capullo, but when they release the inevitable Batman by Snyder omnibus series sometime in the future, maybe then you'll get your wish. Man, you had the same idea as me, but you posted first, so I've got to give you the credit. I'd add the Batman Who Laughs mini (plus the Grim Knight one-shot set right in the middle of it) to this companion omnibus as well, but come to think of it, couldn't it be called "Batman by Scott Snyder and Jock Omnibus", since he pencilled most of this stuff? I feel like there is a lot more DC material out there (not by Frank Miller) that deserves an Absolute edition. I broadly agree - I feel like DC sort of lost the thread of what should or shouldn't be Absolute. I would expect Heroes in Crisis will get one, as *should* Metal with the prologues and interstitial issues by Snyder (the same way FC was put together, essentially).